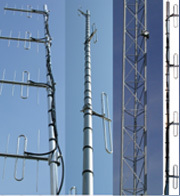 Base antennas, directed antennas and special networks for professional and Radioamater use. In this section you will find antennas for the UHF range over 300MHz, antennas for transmitters, for link between stations and for base stations. All antennas are extremely resistant, made of top quality materials with a lot of care and attention.